How amazing is this crochet midi dress? I love how versatile it is and how friendly it is to my wallet (hello under $35!). You can wear it very casual like I did or dress it up with heels and a bold lip. Versatile pieces that I can wear over and over again will never get old. Especially now that I'm on a mom budget (whose with me!?). For this trip we visited La Jolla, CA. It was so incredibly beautiful!! I can't wait to go back. The ocean was so blue and beautiful. It literally looked like something out of a movie. I would highly recommend stopping by if you are close by in the area. It's not too far from L.A. I hope you have an amazing Wednesday. Thanks for stopping by! Gorgeous dress! I am all for crochets and laces this time of year - so chic and refreshing to wear! Love this dress on you, and it looks adorable with the hat!!! I also like how the inner lining of the dress is shorter than the crochet layer!! 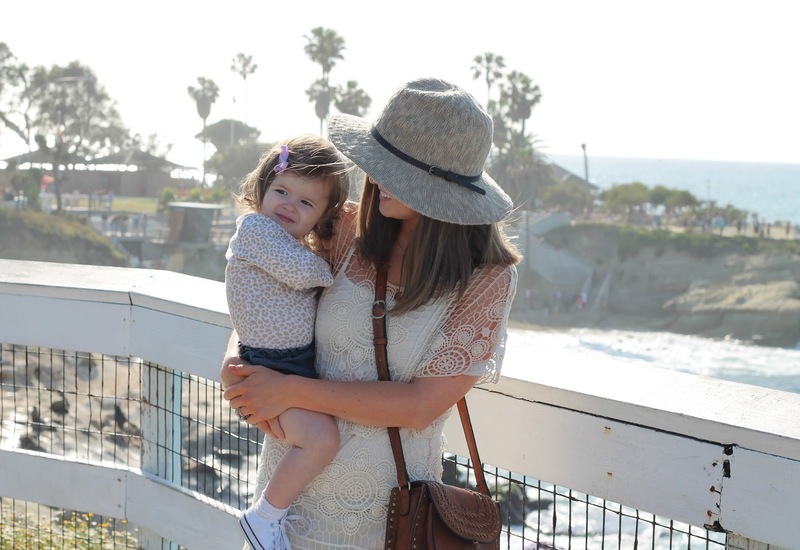 This crochet dress is so gorgeous on you, and your little one is adorable! Great look.